* Compact and powerful, the PRX618S offers the performance of an 18" subwoofer in a package not much larger than a typical 15" sub. With a pole receptacle (that accepts a SS3-BK or SS3-BK24) on the top panel and integrated stereo pass-thru, with selectable HP filter, this is the perfect compliment to the PRX600 full-range systems. Configured with a PRX612M or PRX615M the result is a highly transportable, high performance subs/satellite system. The addition of a polarity reverse options further enables integration with any top cabinet. 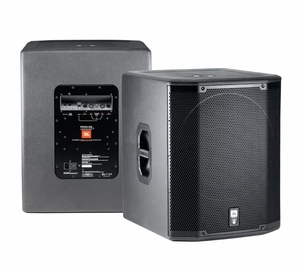 * The PRX618S is a high performance self powered compact subwoofer system. The PRX618S is comprised of a 268G 460 mm (18") Differential Drive� dual voice-coil and magnetic gap, neodymium woofer driven by a Crown Class-D power amplifier. The amplifier input panel offers stereo or mono line level inputs via balanced XLR connectors as well as a single channel speaker level input via a � inch TS phone jack. Signal processing, crossover functionality and limiting for the system is integrated into the input section functionality. Overall subwoofer input sensitivity is controlled by a single easy grip knob and a simple switch enables polarity reversal for sub/satellite system optimization. Signal present and limit lights indicate performance status. * All PRX600 cabinets are built from a combination of 25mm (on the top and bottom for added rigidity) and 18mm, strong, light-weight poplar plywood made structurally sound with tongue and groove joints. All PRX600 Series cabinets are protected by JBL�s tour proven DuraFlex� finish. Grilles are made from dent-resistant 16 gauge steel and handles are made from light-weight glass-filled nylon for added strength and durability.